There are several ways to evaluate the economic viability of a potential CHP project investment and compare multiple energy investment options. The two most common are payback analysis and life cycle cost (LCC) analysis. Both methods require determining costs, revenues incentives and savings attributable to the project, costs attributable to a baseline or alternative case, and developing net annual cash flows (pro forma). A more complex analysis can include state/provincial and/or federal incentives such as tax credits or renewable energy attributes where applicable. Key distinctions are that LCC examines the total life of the project while simple payback gives equal weight to all cash flows before the payback date and no weight to any subsequent cash flows. If a payback rule is utilized, a company has typical cutoff period (e.g., two years) and will not accept projects whose payback takes longer than the cutoff. One of the pitfalls of using a payback rule is that there are not a lot of energy efficiency improvements today that have under a two year payback. CHP is more capital intensive and typically has a 20+ year life, so we need to evaluate CHP in longer terms. A simple payback calculation is still used to determine the potential feasibility for a CHP project, before performing a more detailed economic analysis. A Life Cycle Cost (LCC) analysis examines the total costs and revenues during the life of a project. LCC sums of all recurring and one-time (non-recurring) costs over the life span (or specified period of a project), including capital costs (purchase price, & installation costs), operating costs, maintenance and upgrade costs, plus any remaining (salvage) value at the end of ownership or useful life of the project. A Life Cycle Cost analysis is a useful tool to compare one energy product to another over the life of that equipment, and/or compare a proposed energy project to the ‘do nothing’ scenario where a facility maintains the status quo. Figure 7.1 is the result of a basic LCC analysis for a 1,000 KW CHP system running 8,700 hours per year in a region with $.10/KWH electric and $7/MMBTU natural gas rates. Note that system size and energy rates, incentives, etc. 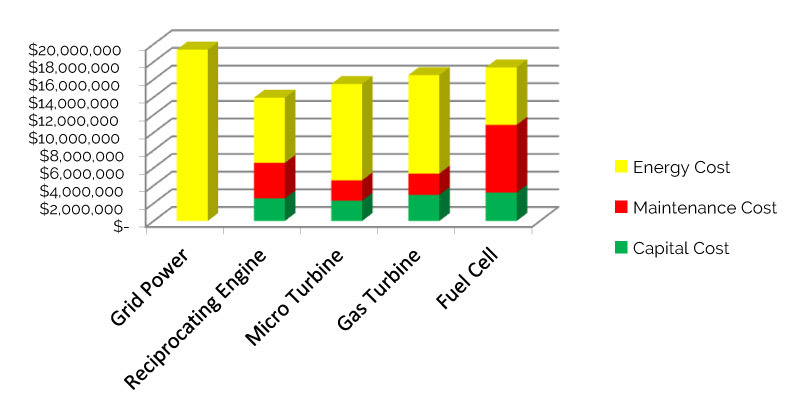 impact the results and may show one type CHP technology has better economics than a different CHP system.